Run of games is no bother! 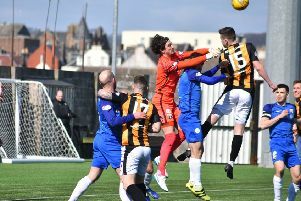 Mark Docherty admits it’s shaping up to be an exciting start to 2019 on three fronts for the Methil men. Saturday’s Scottish Cup win over Berwick Rangers booked a place in the next round at home to Greenock Morton in January. Just a couple of weeks later, on February 2, the Fifers will finally play their Irn-Bru Cup quarter final against Bohemians in Dublin. And, of course, the club will be aiming to maintain its promotion push in League One. Docherty said: “We’re going well in the league and obviously have the quarter final over in Ireland next year to look forward to. “And we’re through to the next round of the Scottish Cup now as well so we’ll see what that brings. “As players you want to have as many games as possible. “Personally I don’t like free weekends. “Especially since I’ve been out injured for a while, you want the games to keep coming thick and fast. The win at the weekend got a bit nervy towards the end, with Berwick pushing hard for a replay at 2-1 down. But the Methil men stayed strong at the back. “Ross Dunlop and Daryll Meggatt have been great,” said Docherty. “The two of them defended really well in the second half and managed to put their bodies in. “Daryll had a couple of last ditch challenges. “I’m delighted as well for Craig McDowall coming in last week. “At half time he makes a great save and keeps us at 2-0.